Chyawanprash – the age old Ayurvedic recipe that restores the health, immunity and youth, is one of the most popular health supplements. It has been consumed by all age groups, from children to elders, in order to enhance their physical and mental growth. As per ancient wisdom, this formula was developed by Rishi Chyawan in his old age to restore his youth and vitality. With modern research and development, all the qualities of Chyawanprash and many more have been packed and bundled into one bottle of supreme health – Eazol Health Tonic. 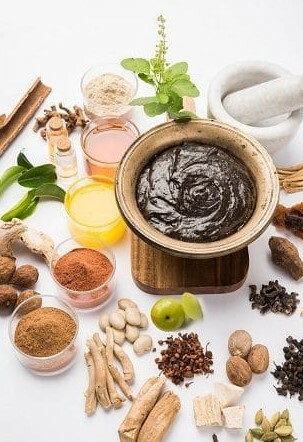 It consists of all the qualities of the old Ayurvedic formula of Chyawanprash, combined with active ingredients that boost cardiac functions, reproductive system, muscular growth and brain functioning. Here are some of the key benefits of this modern liquidChyawanprash – Eazol Health Tonic. · Improves Digestion – Eazol Health Tonic kindles the digestive fire, known as Jathragni* in Ayurveda and improves digestion. It ensures proper bowel movement and helps to maintain peristaltic movements in intestine and ensures gut health. · Cardiac Health Booster – Eazol Health Tonic is a natural cardiac booster. It keeps a check on cholesterol and improves and enhances the functioning of heart and helps maintain blood pressure. · Improves Reproductive System – It improves the sexual energies in both men and women. With ashwagandha,safedmusli and shatavari as active ingredients, it maintains proper hormonal functioning and supports libido, fertility and vitality in both male and female. · Assists in Weight Loss – Its active ingredients work not only to improve digestion but also assist in absorption, assimilation and tissue building process, fixing the metabolism at cellular level. This in return helps in breaking down accumulated fatty acids and hence keeps us in shape. Also, unlike Chyawanprash, it is completely sugar and fat free making it apt for consumption for obese people. · Overall Immunity and Rejuvenation – Eazol Health Tonic cleanses the Ama** - accumulated impurities, toxins from our system, detoxifying liver, spleen, blood, intestines and entire digestive system. It enhances OJAS***, resulting in improved immunity and rejuvenation of body cells and tissues, making us stronger and less prone to infections and disease. · Maintains Blood Sugar – Unlike Chyawanprash, which consists sugar, honey and ghee, Eazol Health Tonic is completely sugar and fat free and its active alkaloids and molecules keep a check on rising level of sugar and reverses the damage that diabetes causes in body. This product is sugar-free and anyone suffering from diabetes can take this. · Pacifies Stress, Improves Memory – Eazol Health tonic helps the brain in maintaining endorphins, serotonin, dopamine and oxytocin –often referred as Happy Hormones. This in turn makes you feel more energetic, focussed, concentrated, reduces stress and helps in achieving an enormous memory power. These are just a few of many other functions of Eazol Health Tonic performs.It brings us in perfect synergy with our system and tunes us up for better performance every day. Eazol Health Tonic is the Health Supplement of today and is the need of every child, adult and elderly. This is the modern liquid Chyawanprash for everyone in the family. **Ojas – As per Ayurveda, Ojas is the essence of all tissues in the body and it enhances the body’s defense mechanism. **Ama – When digestion is not proper, toxins and impurities are produced, known as AMA. *Jathragni – Digestive heat and acid generated in body which is essential to digest anything we eat.